A new app aimed at getting young people to vote, looks likely to reinforce the idea that politics is all about what the government will do for me. Canterbury University student Hannah Duder designed the app which matches parties with users and encourages them to vote. It is potentially a great idea to get disengaged young people involved in the political process. Approx. 40% of 18 to 24 year old didn’t vote at the last election. This sounds sensible enough, but it assumes that voters are only interested in policies which impact them. In doing so it feeds the politics of the lowest common denominator – the politics of me. This might be how our cynical media commentators like to explain all political action but surely from our young people we can look for more. Indeed we all need to stop seeing democracy as a means for individuals or groups to express or represent their own interests. Rather we should see our democratic system as as a way in which we can contribute to the common good – to what is best for our nation. 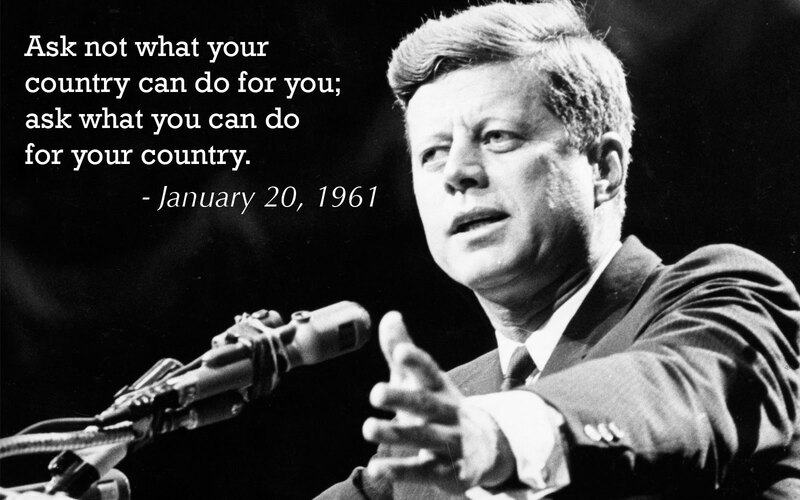 As a President Kennedy said to young Americans – Ask not what your country can do for you; but rather what can you do for your country. His words inspired a whole generation to be engaged in serving both their country and the world beyond. No app was required. This entry was posted in Cultural Renewal and tagged Democracy, Elections, Ewen McQueen, Hannah Duder, political process, politics, President Kennedy, Voting app. Bookmark the permalink.